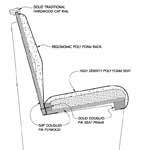 The model 825 has a padded, upholstered seat, and padded, upholstered back with lumbar support. 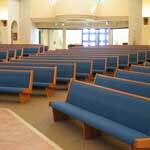 The back, seat, and solid oak traditional style cap rail are routed into the pew ends for added stability. 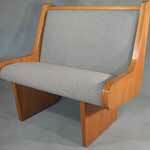 The model 820 has a padded, upholstered seat, with a solid hardwood back. 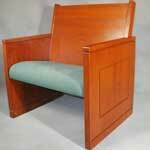 This pew was manufactured using solid American Cherry, and has a custom designed solid Cherry pew end.